I have this custom component set up in HA 0.84.6. It worked fine. I wanted to see if I could sever the cloud connection so I put some firewall rules in my router that disabled internet access for te thermostat. After I did that I could still operate the thermostat from HA just fine. However, my thermostat display kept complaining that it could not connect to the internet. In the next step I deleted my thermostat from the app, deleted my honeywell account and also removed the lyric app from my phone. I also enabled internet access again. This stopped the complaining on the thermostat, and I still can operate the thermostat from HA. However now I loose connection with the thermostat for half a minute or so every 7-10 minutes. It’s mainly an annoyance but it is not nice that sometimes the thermostat shows as unavailable. Any thoughts on what might cause this, or how to investigate? I think quite a few users are using this custom component, and I’ve found it to be much more reliable than the alternative one (and local too ) is what @pho3nixf1re asking realistic? Are the changes possible to merge into the master branch? As I don’t have this thermostat myself anymore I cannot test anything, and it acted up alot for me. The problem with merging this directly into main, is that there are other types of thermostats working on the climate.homekit component, and who knows if those models will still work with these changes. Curious about which thermostat you got as a replacement. I am in the market for a new one as I am still using the ICY (Essent E-thermostaat) which needs urgent replacement because ICY is moving to a subscription based service model. I have been looking out for a decent thermostat but can’t decide on which one to pick, all seem to have their pros and cons regarding HA integration. Got the secure ssr-303 zwave boiler controller. Built a hadashboard with a pi3b+ with touch screen mounted on the wall, wired a cheap chinese humidity/ temp sensor into the pi, glued on the back of the display. The pi 3b+ does hadashboard for thermostat etc, mqtt sending of the temp/hum + room-assistant for ble presence detection <3. In HA you create a generic thermostat. Its been rock solid for about 2 months now! If there’s interest i can do a topic about that little project. I tried this and when I add the code I get “Entity not available…” do I now need to add the entity to the configuration.yaml? I also can’t get it to run with the quick guide: after the configuration notification the pairing.json is made but no climate. entity appears. FYI it seems my T6 is now working with the default HA install. 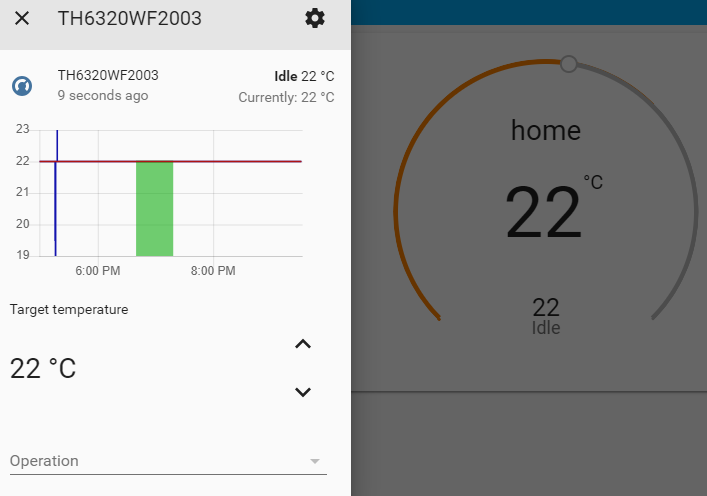 I just upgraded to 87.1 and I now have a card with a slider to control temp, current temp and state. Changing temp from HA works and changing temp on the T6 will update the card in HA after (quite) a while. So all seems fine now. How does your config look like @Michel? I’m now using the custom component, but de info-dev-panel is telling met (HA 0.88.1) that this custom will soon be stopping working. My config has nothing really special for HomeKit, just this to enable discovery. Cool, now it works without the Honeywell API as well. Great! Thanks! I am unable to control the mode of operation of my T6. Can someone help me please? When I click the arrow under operations nothing is available.